Reader Question: How do I live in the moment while making plans for the future? I’m a little confused after talking to a colleague who constantly makes 10 year plans for her life. Comparatively, I have no ambition and make no effort to better myself and my life. How do I live in the moment and plan for the future at the same time? Is setting a high goal and wanting to achieve it egoic in nature? Is just focusing on now, while making no future plans, lazy? 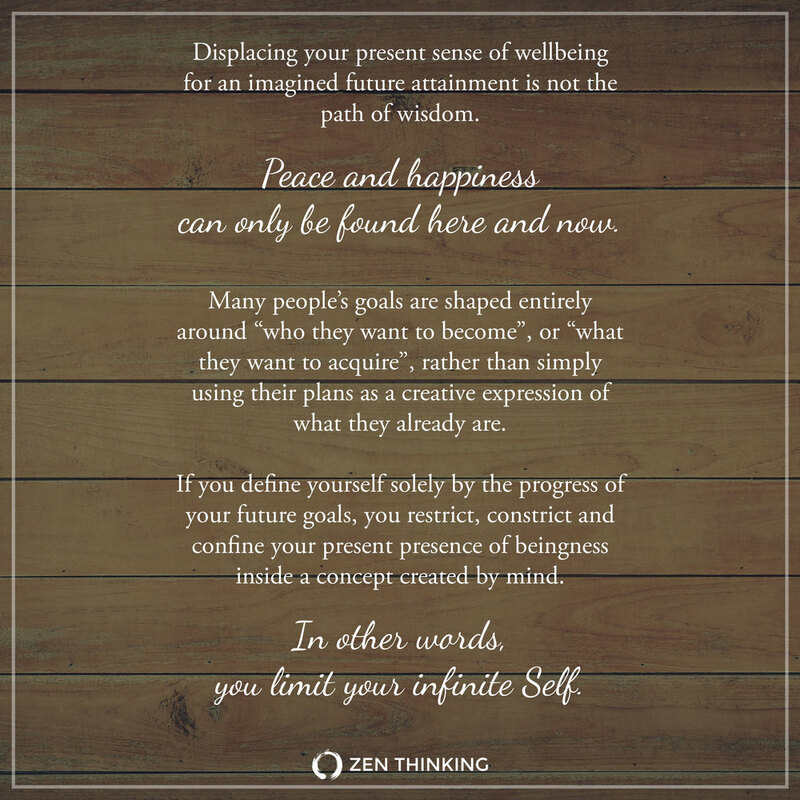 From the Zen perspective, making plans for the future needn't be something that reinforces the false ego and that gets in the way of self-realization. Goal setting can certainly be a part of a full and enriching life of non-duality. But, goals can also be a problem if you believe you need to achieve or accomplish something in order to be happy or "successful". Displacing your present sense of wellbeing for an imagined future attainment is not the path of wisdom. Peace and happiness can only be found here and now. Many people’s goals are shaped entirely around "who they want to become”, or "what they want to acquire", rather than simply using their plans as a creative expression of what they already are. If your self-identity is attached too tightly onto your future plans however, then you lose yourself within a false universe of thought—one that is defined by a perpetual sense of lack. There is a big difference between these two notions. The intention behind a goal will determine the nature of one's present inner-freedom and its resulting inner-peace. Unfortunately, many people believe that they will never be happy, content, or successful outside of whatever self-identity they've conceptualized, dreamed of, and have projected onto their future "me". When (and if) that “future” ever actually arrives, its resulting happiness will be fleeting. The glow of success will fade almost as soon it is realized, re-igniting the spark for even more wanting, needing, and desiring. And so, a person's wellbeing, here and now, is never fully realized. It remains relative to the current status of their goal. Their happiness is impermanent and they remain in a state of emotional flux. If you define yourself solely by the progress of your future goals, you restrict, constrict and confine your present presence of beingness inside a concept created by mind. In other words, you limit your infinite Self. In doing so, you concede that "you" are nothing more than a concept who is forever bound by your worldly “performance” and by the things you attain. It convinces you into falsely believing that happiness can only be found by "becoming" what you presently are not, or by "getting” what you do not yet have. Without this self-awareness, goal setting can reduce your aware-presence-of-being into a delusional thought of negative self-identity—a false "self” who is defined by its egoic story and conditioned by its warped opinions of happiness, success, the world, and life itself. If your happiness is always attached to something that you need to acquire, then it will never be found. The search will never end—happiness will remain forever pending. The truth is, there is nothing you need to be or become. True peace, contentment and happiness is here and now, unattached to any goal. On the flip-side however, is the pure joy of making future plans as a creative expression of what you already are—which is an infinite and unbound presence of awareness. If you aren’t driven by a sense of lack (by the feeling that something is missing in your life, that ther's a hole that somehow needs to be filled), then goal setting can be an energized and mindful endeavour, one that needn't affect your wellbeing by either your success, or failure. When you know your Self as Aware Presence—a formless conscious essence that can’t be conditioned or limited, whose happiness can’t be offset by a distorted opinion of oneself—then working on one's goals becomes an enthusiastic, artistic, compassionat, and altruistic celebration of the infinite Self. With a mindful approach such as this, making plans for the future is an honest and loving reflection of the Absolute, a profound expression of unconditional peace, love and beauty.